Through May 25,, Amorepacific U.S. will be displaying its wares at its first global beauty pop-up shop in New York City, in partnership with Marie Claire. In an exclusive grand opening last week in the West Village, the shop opened to attendees who browsed a selection of Amorepacific brands, like Laneige, a skincare line that uses Water Science Technology, Mamonde, flower-inspired skincare and Iope, a Korean skincare line, in addition to Amorepacific, Annick Goutal and Sulwhasoo. The pop-up is the first time these brands have been available in the same space, part of the company’s goal to celebrate global beauty. 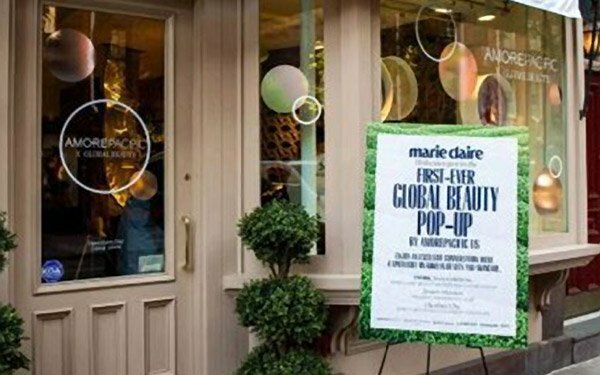 The Marie Claire May issue celebrates the same topic and was launched along with the pop-up shop. The launch was led by Marie Claire's executive beauty editor Jennifer Goldstein, Amorepacific U.S. president Jessica Hanson and cofounder-chief curator of Soko Glam Charlotte Cho. The pop-up will continue to offer special activities, such as meet and greets with beauty experts and products sampling, through May. Visitors receive a 10% discount. In addition to exploring beauty around the world, Marie Claire’s global beauty issue includes its Prix d'Excellence de la Beauté awards. Amorepacific won the award for their Essential Crème Fluid. "Through our Global Beauty platform, Marie Claire has been dedicated to discovering products, ingredients and technologies that help women around the world feel more beautiful," stated Nancy Berger, Marie Claire vice president-publisher and Chief Revenue Officer. Amorepacific was founded in 1945 and includes a portfolio of over 20 cosmetics, personal care and health care brands. Its brands span markets in Asia, North America and Europe.